Charlie Sheen and Moammar Gaddafi have been taking up the frontlines of the media for weeks now, so I had to look at their horoscopes. They both reveal obvious signatures, even though no birth time is available for Gaddafi. 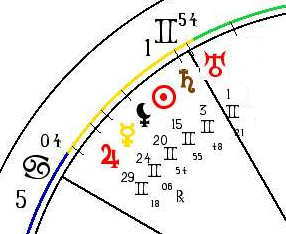 • His Sun in Virgo is conjunct both Uranus and Pluto which are only a degree apart. The combo certainly gives him reason to act like a Wild Man. Uranus pushing him to be his own free, unique being. Pluto giving him the macho, tough guy, but also sometimes brain dead character. If you imagine putting the three glyphs together in one image, it would give you some good hints about Sheen. The Pluto glyph is most suggestive. I am reminded of some other celebrities who have Sun conjunct Uranus. Jerry Lewis and Rudy Giuliani. Both one-of-a-kind, go-it-alone, “crazy” men. The French call Lewis Le Roi du Crazy. The King of Crazy. Giuliani used to be the Emperor of Manhattan, in his mind and a few others. Robin Williams has Pluto conjunct Mercury right at his midheaven representing the wild, mischievous trickster he often portrays. Sheen has a combination of these qualities, at least to some degree. 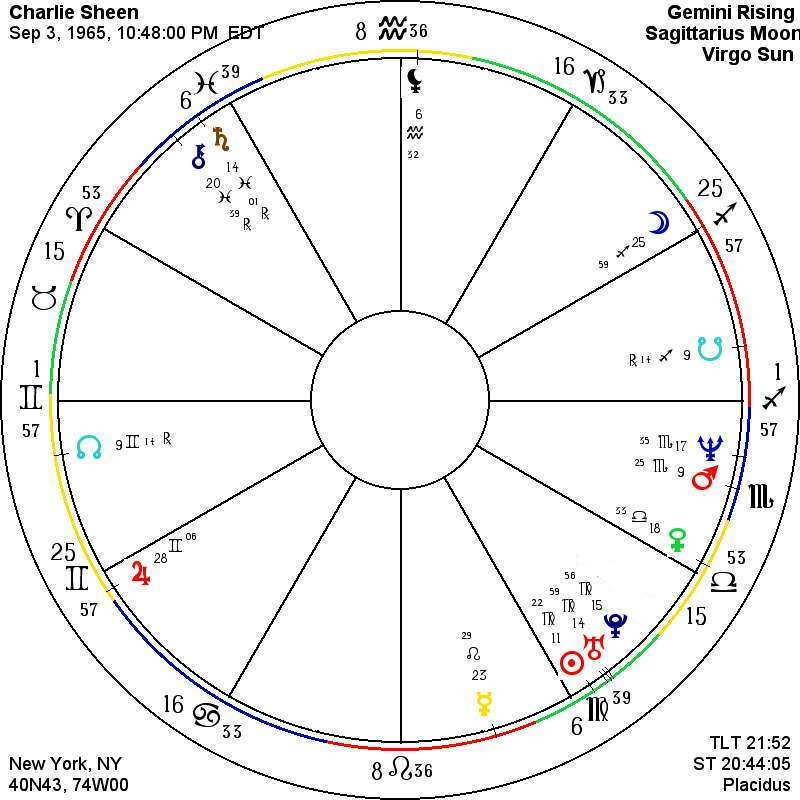 • Sheen’s midheaven (public persona) is at 8 degrees of Aquarius. His Black Moon is within 2 degrees - giving him more off-the-wall potentials. The 8 may give him some Messiah complex things to deal with. He thinks he’s great. Whatever the rest of the world thinks is irrelevant. • Sheen has almost all mutable planetary placements. He is subject to sudden and frequent change. • His Ascendant is in Gemini which can contribute to his changeability as well as just a general chameleon nature. Life has always and will likely continue to be wild for Charlie, but the present period - covering a long time - is bound to be stressful. 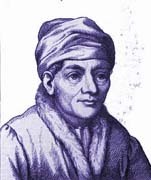 He has a whole host of luminaries passing through Pisces and OPPOSING - in his case battling with - his Sun-Uranus-Pluto complex. 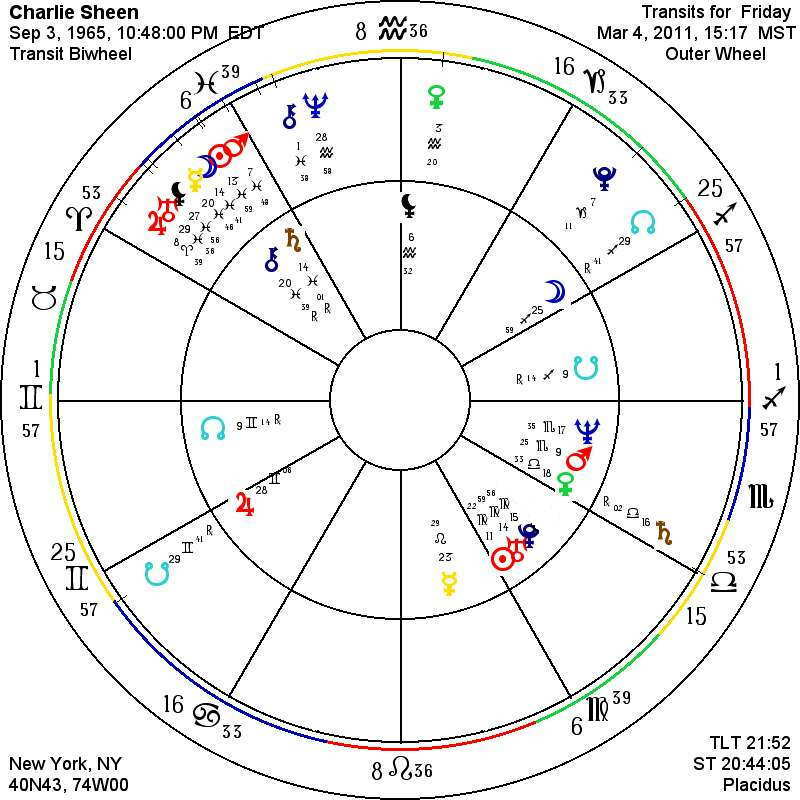 Actually, most of the outer wheel (transiting) planets oppose most of his inner wheel natal luminaries. 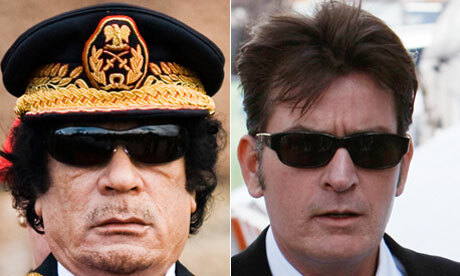 None of this exonerates any of Charlie Sheen’s behavior. It only helps to explain some of it. This chart seems to work pretty well since it puts Aries - aggressive, energetic, willful - at his Midheaven and Leo - the royal one - at his Ascendant. 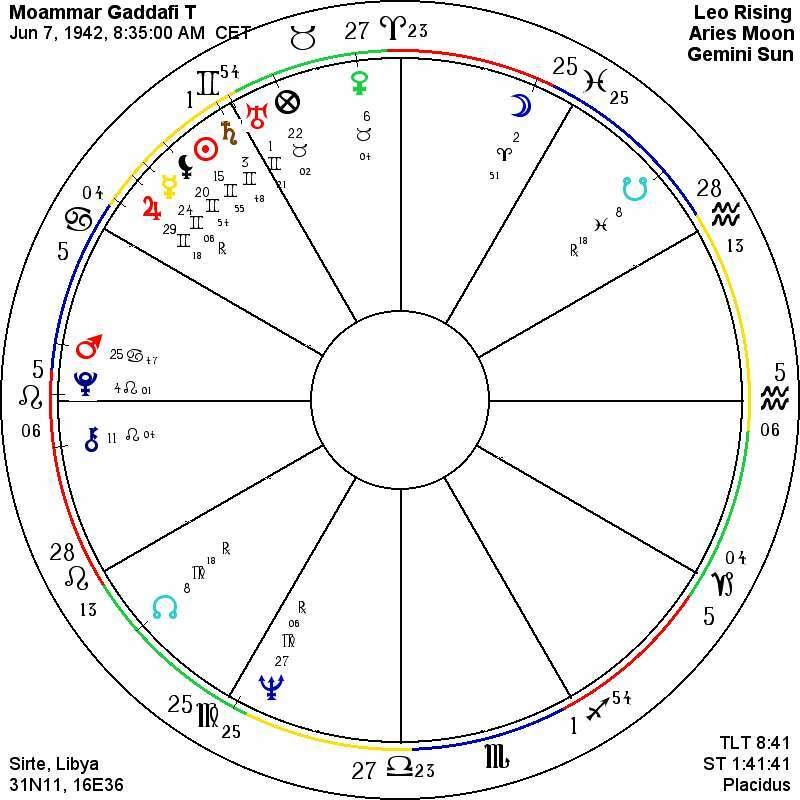 • The big Signature for Gaddafi is five (5) planets plus the Black Moon in Gemini. Moammar is off balance - for good or ill - from day one. Half his luminaries are in Gemini. Gaddafi may feature himself as a MOSSIAH (note the spelling), but he can thank his stars that he lasted this long on the world scence. In my opinion, it takes an enlightened being to handle all the energies he has bottled up in Gemini (or any sign). • There are a number of similarities in Gaddafi’s chart to that of Zelda Fitagerald who spent much of her life in an insane asylum. She only had half as many planets in Gemini. There are even more similarities to that of Mad King George III of England who lost his American colonies. George was definitely mentally disturbed from his early days. George had six planets in Gemini and another at 29 degrees of Taurus. No doubt Gaddafi is a talented man, a fighter, leader, etc. But, power can destroy the best of people and those around him/her. 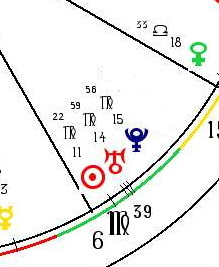 His chart as laid out has Pluto right at his Ascendant, which is a very suggestive placement. • One more thing: All of Gaddafi’s luminaries are placed between 27 degrees of Virgo and 2 degrees of Aries - a little more than 150 degrees out of 360. It is like he hs a house and puts all of the furniture on one side of the room. Full on one side, empty on the other. Another picture of Gaddafi. 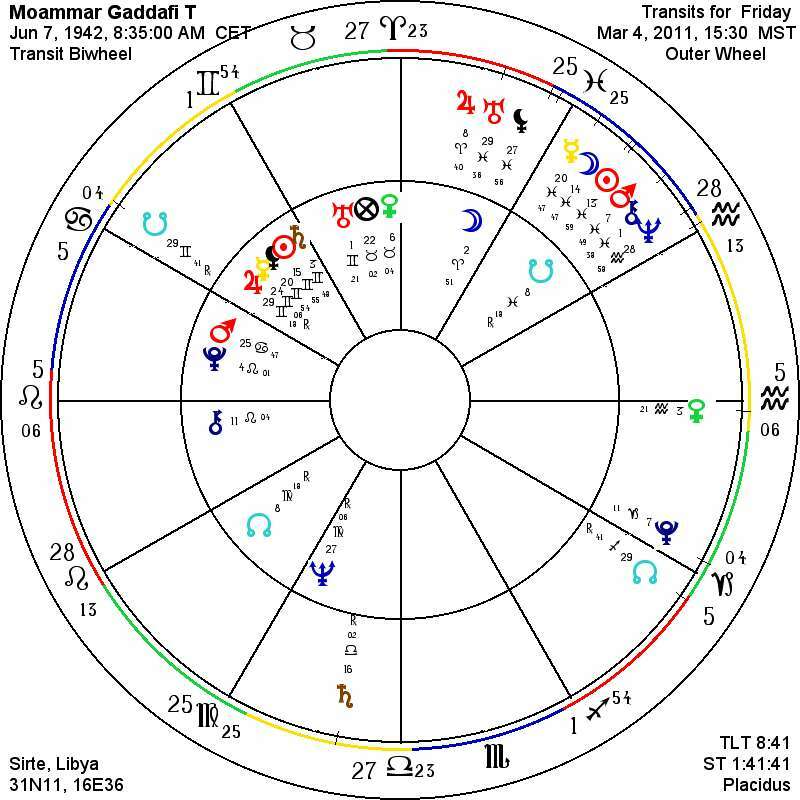 Like Sheen, Gaddafi has major transits to his Signature Gemini stellium. Instead of Oppositions, he is experiencing SQUARES which will last a long time. Mo’s time is probably up. There will surely be lots more violence, death ahead as you see a host of planets lined up in his 8th house of death and transformation. • Sabian Symbol. 9 degrees of Virgo: “An expressionist painter at work.” I am not sure what this symbol for Gaddafi means, I don’t know his whole story well enough.